Mayonnaise for Smooth, Soft Hair ! Home / Uncategorized / Mayonnaise for Smooth, Soft Hair ! Do you have dry and damaged hair ? If yes, then you should definitely try this recipe 🙂 Mayo treatment can give you soft, shiny and strong hair. Protein and moisture treatments for your hair can be expensive, but there is an easy and affordable homemade solution that you probably already have in the refrigerator. You can make a rich and nourishing protein treatment for your hair using eggs mayonnaise. Mayonnaise is made from eggs, oil and vinegar, all of which are recommended for use on hair. Eggs and oil fortify and moisturize dry hair, while vinegar is often used to give hair more body and bounce. 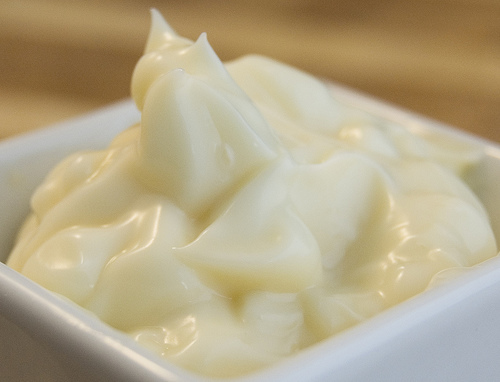 If your hair is dull, lackluster and limp, try a homemade mayonnaise hair treatment. I do this once a week and it makes my hair looking shiny, soft and bouncy again. Simply apply a liberal coating of mayonnaise throughout your hair. A shower cap or plastic bag on your head will also help contain it. Ta-Da ! Your hair would be shinier, smoother and healthier. Previous Yummyyyy Hot Chocolate !! Next Benefits of Papaya ! !